This is the most overlooked change in the business of Trauma Surgery staffing; so why don't more people know about it? No facility wants to use locums. Let’s face it; it’s expensive, there’s limited accountability, and you often don’t know what you’re getting. One bad locums provider can round up enough complaints over a weekend to set your program back months, or worse set off audit filters that will have their charts under scrutiny the next time there’s a site visit. A system for downloading key information to the locum physician. Successful locum tenens surgeons get up to speed quickly on local workflows and protocols. InterTrauma has developed efficient processes for quickly capturing client preferences and ensuring that our locum physicians understand the practice philosophy of the trauma medical director. A system for enabling participation in PI activities. According to the *Orange Book*, any physician who takes call at a trauma center must participate in at least 50% of the program’s PI activities. InterTrauma uses HIPAA-compliant videoconferencing to enable our locum physicians to take part in PI meetings. Plus, participation is fully documented. A system for supporting effective leadership. A trauma surgeon is not just a provider of care, he or she is the leader of a system of care. InterTrauma physicians are fully vetted for strong leadership skills. And they receive additional training to help them quickly establish effective communication patterns with local trauma teams. Also, give a strong consideration to a locums group that has some clinical accountability. Locums can be dicey, but doesn’t have to be. It is just the way much of the industry evolved in a vacuum of physician leadership. Physician staffing is a major challenge for trauma centers today. Many trauma program leaders are finding it harder than ever to maintain a full team of trauma surgeons. Top-notch trauma surgeons are in short supply. And if your hospital is in a non-urban or remote location, the selection can be even narrower. Most surgical critical care fellowships are in larger cities, and recruiting new practitioners to non-urban facilities can be a challenge. Trauma programs today are frequently hit with administrative mandates to increase clinical services. Program leaders may push back, but in many hospitals there is strong sense that trauma surgeons are available to cover any service gap. These demands leave the trauma program short-staffed and create an acute need to recruit more trauma physicians. Physicians in all specialties are facing increased levels of burnout, and trauma surgeons may be at higher risk. Clearly, physicians who are edging toward burnout are more likely to resign and seek other employment. In some hospitals, heavy workloads caused by insufficient staffing have led to the mass resignation of the entire trauma medical staff. All of three of these problems have the potential to cause a staffing crisis in your trauma center. The solution? Trauma program leaders today need to make physician recruiting and retention a top priority. The key is to pursue a comprehensive staffing strategy. To find out how, download *The Essential Guide to Finding, Recruiting, Hiring and Retaining Trauma Physicians*. What’s the problem with this approach? You will probably have to pick from a severely limited pool of candidates. You see, most hospitals have a contractual agreement with one of the large national healthcare staffing companies. What hospital recruiters may not tell you is that they will only send you physician candidates available through the hospital’s contracted staffing firm. But for large staffing firms, trauma is only a very small part of their business. As a result, these firms do not understand the special needs of trauma programs. 1. You may not get candidates with the strongest clinical skills. Big staffing firms try to weed out problem candidates. They do not have the expertise to evaluate physicians for clinical excellence and trauma leadership abilities. 2. You will get little support with program viability. Large staffing firms are unaware of the unique financial needs of trauma programs—or how physician documentation and coding are critical to financial viability. 3. You will get no support for ACS requirements. General staffing firms are not structured to provide physician candidates who support program compliance with the Orange Book and other trauma standards. The bottom line is that if you rely exclusively on your hospital recruiting department, you may be reducing your chances of hiring a “star player” who helps propel your trauma team forward. *But here’s a secret…despite what your physician recruiting office tells you, staffing contracts are NOT exclusive. *That means most trauma program leaders can receive permission to work with a staffing firm that specializes in trauma physicians. It is often more work for the physician recruitment office, so there is some inertia associated with adding a company. Do you want an alternative to the “big box” staffing firms? InterTrauma specializes in staffing for trauma and acute care surgery. We leverage an extensive network and careful due diligence to find “the best of the best” trauma physicians. Led by an active trauma surgeon, InterTrauma vets all physician candidates for clinical and leadership skill. It also provides locum tenens physicians with extensive support. This ensures that they thrive as team leaders, help optimize charge capture, and make a strong contribution to maintaining designation/verification standards. To find out more, contact InterTrauma today. Why is Med Staff Credentialing Hopeless? Being a surgeon is a great career. However, sometimes a surgeon has to deal with medical staff and credentialing. Thankfully for most surgeons this is a rare occurrence and they only have to think about it whenever they start at a new hospital. When working as a locums or per diem surgeon this is a problem that is encountered on a frequent basis. There is no standardized credentialing application. And to make matters worse despite having the same requirements at almost every single hospital, without the same forms, new letters of recommendation and new verifications are required continuously. As a surgeon that works at different facilities the problem compounds itself because when you work at numerous places you have to get more more and more verifications and the problem expands exponentially causing a great bureaucratic burden. My dream would be to have a standardized credentialing system and a unified verification platform that would allow hospitals to indicate when a surgeon has worked at a particular location much like the FCVS system works. Another irksome aspect of this is requiring frequent letters of recommendation. These letters of recommendation are oftentimes accompanied with an evaluation form. It would be so much simpler if this could be done annually and logged into a unified database where it could be accessed by all credentialing bodies. We live in an era where cars drive themselves and our phones have more computing power than ever before. It does not seem like it would be a difficult process for a large accrediting body such as JCHAO to provide a service such as this. In an era where we value and accountability is prized this is one area of Medicine that is lagging far far behind. 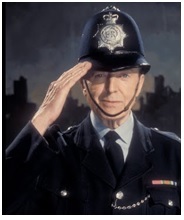 Ask anyone outside of the UK (and most people within the UK for that matter) to conjure up an image in their mind of a British police officer and what will you get? A friendly and approachable man in his smart white shirt and black tie wearing a strange chin-strapped rounded helmet adorned with a gleaming silver royal crest and nothing more than a truncheon with which to effectively discharge the duties of his office. For the most part this continues to remain true, and aside from the incremental introduction of stab-vests, CS spray, Tasers and a few other bits of kit, the vast majority of British police do not carry firearms. Official UK government figures () show there to be just over 6000 armed officers in England and Wales, a mere 5% of the total number of police officers in the country. In the year ending 31st March 2017 there were only 10 incidents of police officers discharging their weapons in the whole country. Firearms officers are normally only dispatched to incidents believed to involve a firearm. Gun crime in the UK continues to pale in comparison to that of the US. Guns were used in over 60% of homicides in the US in 2016 compared to 4.5% of homicides in the UK in the same year (). Whilst gun ownership is enshrined in the US Constitution, private ownership of handguns was effectively banned in the UK in 1997 following the notorious Dunblane Massacre the previous year when 16 kindergarten-aged children and their teacher were shot dead in their school gymnasium by a lone gunman. Former world number one tennis star Andy Murray was an 8-year-old pupil at the school at the time and narrowly escaped. The biggest threat with regards to firearms in the UK is not from private owners, but instead is believed to come from pre-planned Marauding Terrorist Firearms Attacks (MTFA). The current threat level for international terrorism in the UK, as determined by the security services remains at ‘severe’, meaning an attack is highly likely. Since the 2008 Mumbai terror attacks which killed over 160 people and the November 2015 Paris attacks in which 137 people died (both incidents involving mass shooting and bombing campaigns), the security services have ramped up preparations for similar such attacks in the UK. Whilst the 20-mile stretch of water that separates the UK from the rest of continental Europe offers a slight degree of protection against the free movement of automatic and semi-automatic weapons witnessed elsewhere on the continent, it is deemed to be a case of ‘when’ not ‘if’ a MTFA occurs on British soil. This ongoing threat has prompted a paradigm shift in the image of British policing. It is now common place to see armed officers with Heckler & Koch MP5s and G36s patrolling airports, subway stations, shopping malls, tourist hotspots and even Christmas markets. An 11% increase in the numbers of armed officers was seen in 2017, and alongside the recruitment drive and increased police funding, senior officers have begun to develop new tactics to confront the evolving MTFA terror threat. In addition to the regular deployment of firearms officers, there is now a 24-hour immediate response team of highly trained CTSFOs ready to respond to an unfolding MTFA. Established in the run up to the 2012 London Olympic Games, these elite police officers train alongside special forces soldiers to hone skills in close-quarter combat, sniping, fast-roping from helicopters, marine operations and siege tactics. In major cities congestion, pedestrianised zones, abandoned vehicles and street furniture can pose significant obstacles to emergency services responding to a fast-moving MTFA. To counter this, London’s Metropolitan Police Force have access to a fleet of high-speed BMW GS800 motorcycles, each capable of carrying 2 firearms officers to the scene of an attack. Previously, armed incidents were dealt with by setting up cordons to contain a threat and attempts made to negotiate with the attacker. This tactic would prove hopeless against ideologically-driven terrorists with suicidal intent and automatic weapons, leaving innocent civilians in their immediate vicinity as sitting ducks. Therefore, the response to such an incident now would involve the first armed officers on scene immediately moving forward to confront and neutralize the threat with lethal force. This would involve them stepping over the bodies of the dead and injured to deal with the attackers in the ‘hot zone’ leaving specialist EMS and fire crews to move in to the ‘warm zone’ behind them to provide battlefield-style triage, immediate emergency treatment and rapid evacuation of injured civilians from the scene. During a sustained MTFA, plans are in place under the banner of ‘Operation Temperer’ to draw on the armed resources of the regular army, the Ministry of Defence Police and the Civil Nuclear Constabulary (who guard the UKs nuclear sites) to backfill regular armed police roles and provide additional operational capability. If required, special forces personnel can be directly deployed to confront and neutralise a terrorist threat. On 22nd March 2017 a lone attacker drove his van at pedestrians walking along London’s Westminster Bridge, killing 4 people and injuring 50 others before fatally stabbing an unarmed police officer outside the gates of the Houses of Parliament. At the time a friend and colleague of mine who is a British Army doctor was refereeing a military rugby game just outside of the city. One of the players on the field happened to be a special forces soldier. As the attack unfolded many miles away a helicopter landed unannounced in the middle of the field of play. That particular special forces soldier was promptly summoned into the helicopter and flown away before anyone on the field had any idea that a terrorist incident was in progress. Clearly this particular soldier was on standby for just such an incident. The UK has seen an uplift in armed police resources and operational capability in response to world events in recent years and the ongoing terrorist threat closer to home. This alongside the establishment of the London Major Trauma system in 2010 followed by similar regionalised trauma systems across the country has enhanced the UK’s ability to respond to mass casualty events. Lessons continue to be learnt from recent incidents such as the 2017 Manchester Arena bombing, London Bridge attack and Grenfell Tower tragedy. Through multi-agency training and proactive preparation more lives will continue to be saved in future. What Makes an Awesome Trauma Surgeon? Clearly, the ideal physician candidate is a high-quality surgeon who can demonstrate both good patient outcomes and a safe decision-making approach. However, strong clinical abilities are not the only requirement for a successful trauma surgeon. By nature, trauma surgery calls for strong leadership skills. Successful trauma surgeons have the ability to both inspire and orchestrate a trauma team. They are level-headed and have a treatment vision that drives patient care. Above all, they are respected by everyone they come in contact with, and they understand that a raised voice is only effective when used sparingly. Good trauma surgeons are also team players. Look for candidates who are willing to take part in referral recruiting activities, such as giving clinical presentations to paramedics. Certification as an ATLS instructor is also a good sign, since it shows a candidate’s commitment to the overall trauma system.